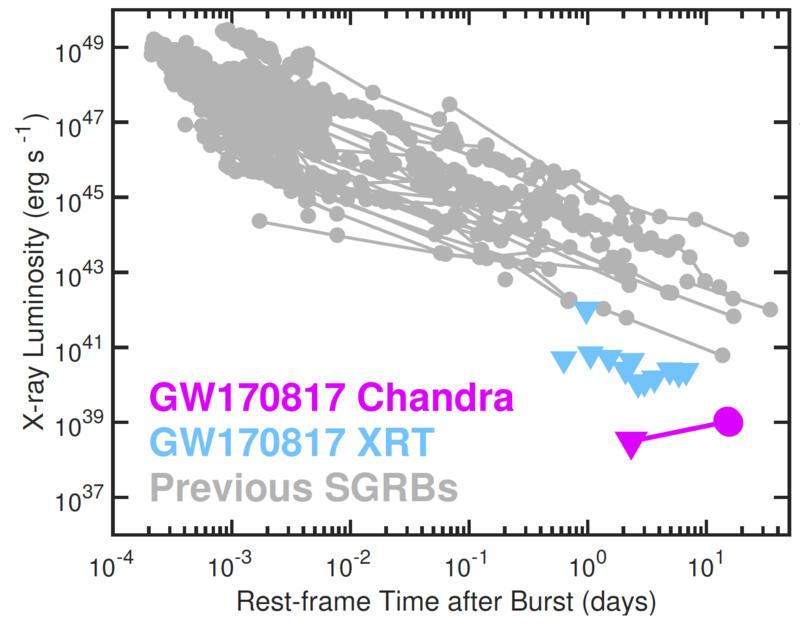 Light curve of the X-ray counterpart to GW170817 from Swift and Chandra compared to other SGRBs. Following the spectacular data set afforded by our programs at radio, optical, near-infrared, and X-ray wavelengths, this paper represents a comprehensive comparison of the electromagnetic counterpart to GW170817 and their cosmological analogues, short-duration gamma-ray bursts. This comparison is enabled by the extensive data set we have collected over the years and from the literature, spanning 13 years (2004-2017) and comprises 36 events. We find that the X-ray and radio emission is orders of magnitude less luminous than that for on-axis short GRB afterglows, and ~50-500 times less luminous than the faintest observed such emission from short GRBs. We find striking similarity between the densities and kinetic energies inferred from the radio and X-ray counterparts to GW170817 compared to those inferred from short GRBs. This suggests that viewing angle effects are the dominant, and perhaps only difference between their behavior. Compared to previous claimed kilonovae following short GRBs, we find that the kilonova of GW170817 is under-luminous by factors of ~3-5, suggesting a range of masses and velocities of neutron-rich material ejected during mergers. Finally, we provide a quantitative comparison of the properties of the host galaxy of GW170817 (NGC 4993) to those of short GRBs. We find that NGC 4993 is superlative in terms of its old stellar population age, low star formation rate, and large optical luminosity, while it is fairly average in terms of its size and stellar mass! We also find it is located quite close to its host galaxy center compared to other short GRBs, indicating that its neutron star binary progenitor may not have received a very significant kick as we infer from past events.